Dense breasts are a risk factor for developing breast cancer, and, even more importantly, small breast cancers can be hidden in dense breasts on a mammogram. To protect your health, you should talk to your doctor to find out whether your breasts are dense and learn about additional screening methods that can increase your chance of early detection. Breasts consist of three types of tissue: fatty, connective, and glandular. Fatty tissue is made up of fat cells. Connective tissue is made up of fibrous cells that provide shape and support. Glandular tissue is made up of milk glands and milk ducts. Breasts that contain more connective and glandular tissue than fatty tissue are considered dense. It is a misconception that if a woman’s breasts feel firm, they must be dense. The only way to tell if you have dense breasts is with a mammogram. After examining the image, your radiologist will fit you into one of four categories, according to your breast density. Age. Younger women are more likely to have dense breasts and breast density tends to decline with age. Roughly 50-60 percent of women aged 40-44 have dense breasts, while only 20-30 percent of women aged 70-74 have dense breasts. Genetics. Research indicates that women whose mothers had dense breasts are more likely to have dense breasts themselves. Weight. Women who are low to normal weight are more likely to have dense breasts than women who are overweight or obese. Hormone Therapy. Women using hormone replacement therapy or hormonal contraceptives, such as the birth control pill, are more likely to have dense breasts. Children. Women who become pregnant before age 24, breastfeed, and have three or more children are less likely to have dense breasts. Medication. Women being treated with hormone medication such as tamoxifen (used to prevent breast cancer) are less likely to have dense breasts. Since most breast cancers start in glands and milks ducts, women with dense breasts are at a greater risk to develop breast cancer, as much as 4-6 times greater, according to the National Cancer Institute. It is often difficult to detect cancer in women with dense breasts using traditional mammography alone because on a mammogram, dense breast tissue as well as cancers appear white. Therefore, a white cancer can be easily hidden in a background of white dense breast tissue. Searching for a breast cancer in dense breasts has often been described as similar to “looking for a snowman in a snowstorm.” On the other hand, cancers are easier to detect in non-dense breasts because fatty tissue appears black on a mammogram, so the white cancer stands out like a lightbulb against a black background. Despite this, mammogram is still the most reliable exam for initial detection and screening for breast cancer. According to Dr. June Chen, Medical Director of Breast Radiology at Breastlink Newport Beach, “screening mammography remains the best examination for early detection of breast malignancy in ALL women. However, for women who have particularly dense breasts, your physician may also choose to order an additional screening exam..."
3D Mammogram (Tomosynthesis). A traditional mammogram takes two images of the breast, but a 3D mammogram takes a series of images from multiple angles, which are then compiled in a computer to create a three-dimensional model of the breast. Radiologists can then scroll through the model, examining each slice individually, and zoom in on areas of concern. 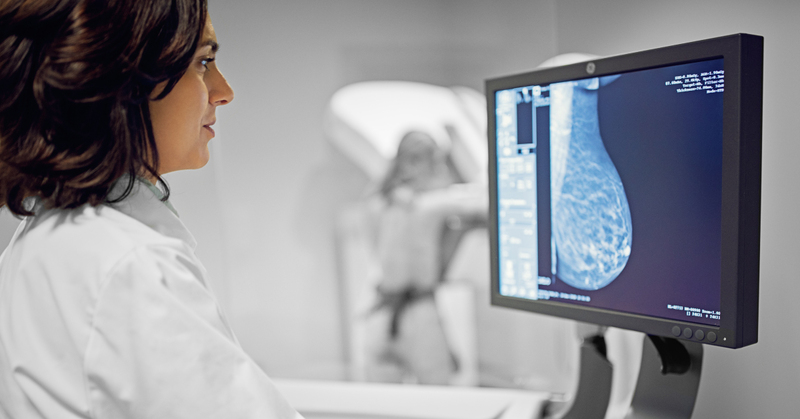 Several studies have found that 3D mammography significantly increases the cancer detection rate in women with dense breasts across all age groups. According to Dr. Chen, “research studies have shown that tomosynthesis (3D) mammogram in combination with 2D mammogram is better at detecting breast cancers as compared with 2D mammogram alone." If you have concerns about breast density or feel that you need additional screening, talk to your doctor about the option that is best for you and your health.